This is no longer the location. For the new location, click here. Where to buy a bus ticket to Oaxaca in Mexico City’s historic center? This has been a dilemma and frustrating for foreign travelers for many years. 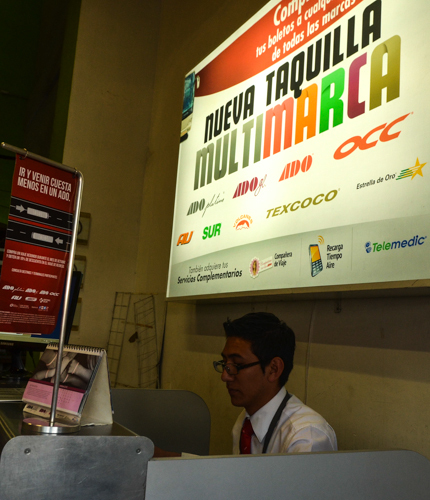 We cannot use non-Mexican credit cards to buy an ADO bus ticket to Oaxaca (or anywhere ADO operates) online. Heretofore, the only solution was to go to Mexico TAPO (the regional bus station) to buy an advance ticket (45-minute taxi ride one-way) or show up on the day you want to leave and hope there is a seat. Don’t blink! You might miss it. After a frustrating hour on my computer and then again with the concierge at my otherwise absolutely wonderful and affordable Hotel Catedral, I accepted that I could not change the system. They suggested I might buy a ticket at OXXO (the convenience store). Not wanting to waste another moment, I went on to spend three wonderful hours at the Secretaria de Educacion Publica (SEP) to view and review 1923-1928 Diego Rivera murals. My hope was that sometime later, aka mañana, perhaps I would source a ticket location. So, I followed his instructions, but I crossed Calle Monte Piedad from 5 de Mayo to walk on the Zocalo side turning left and heading away from the Cathedral as instructed. No store where the bell captain said there should be one. Exasperated, I pivoted. Un milagro! Don’t blink! You might miss it: A teeny, weeny sign hung high above and to the side of an arcade entryway leading to restaurants and artisan collectibles on the upper floors. I was deluged by eager young people promoting said establishments and in the obscurity of the arched tunnel could not see the small, portable stand with signage facing the opposite wall promoting bus ticket sales. So, again, after seeing the street sign, I said, Where is the bus ticket office? There, they said, pointing about five feet away. 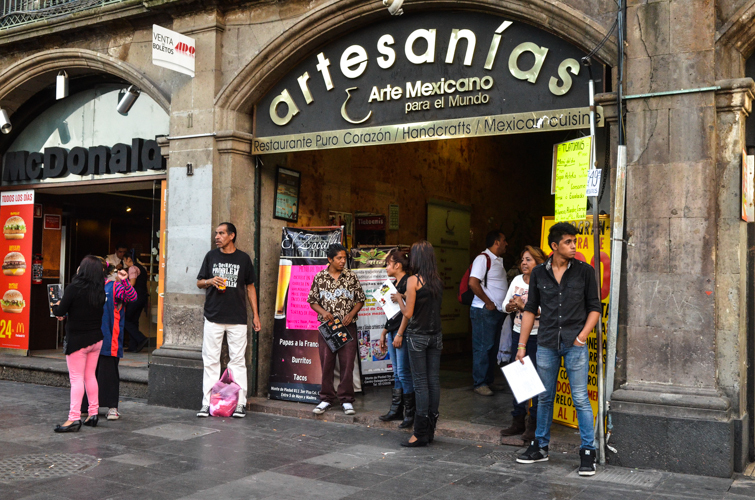 MultiMarca ticket stand, Ave. Monte Piedad #11, between 5 de Mayo and Francisco I. Madero, across from the Zocalo and next door to McDonald’s soft serve. Open daily 9 a.m. to 5 p.m. Cash only if you are a foreigner! One-way, 6-hour bus ticket to Oaxaca on ADO GL is $584 pesos. No phone. They use wide-band Telcel USB to connect to the Internet and process tickets. In case you forgot, this is the landmark! This entry was posted in Cultural Commentary, Oaxaca Mexico art and culture, Travel & Tourism and tagged ADO, bus, Diego Rivera, Mexico, Mexico City, Oaxaca, SEP, ticket, tourism, transportation, travel. Bookmark the permalink. Thank you very much for sharing these informations. I’m planning to visit Mexico in August/2016 and I hope you can help me with this: I’m having a lot of trouble to find bus tickets from Puebla to Oaxaca. In the ADO website they don’t have options from Puebla to Oaxaca anymore. When I asked it to the attendant, he told me that ADO is not offering routes to Oaxaca State anymore. Do you know about other bus companies that have this option and are also reliable to get in Oaxaca trough Puebla? and if it is not a lot to ask, from Oaxaca to San Cristobal de las Casas? This is strange because I always have taken the ADO bus from Puebla to Oaxaca. Did you go online to the ADO website to check departure and arrival cities for ADO. From Oaxaca it’s either ADO or OCC to San Cristobal. Luise, it is now necessary to fly from Mexico City to Oaxaca during the blockades that disrupt ground transit. The usual bus routes are blocked which is why ADO has suspended service. Also, if you want to go to Chiapas, you need to fly from Mexico City to get there. Once you get to Oaxaca by air you’ll need to see if ADO has resumed bus service to Mexico City. Hi, it is very easy to get to the TAPO station. Hop on the Metro and get off at San Lazaro station. Follow the signs to TAPO upstairs and voila, you will find a ADO office selling tickets to Oaxaca. Got there in 15 minutes and bought tickets in another 5 minutes. 580MXN one-way. Good luck! This is excellent advice, too, Win. Thanks for sharing. Still, for those staying in the Zocalo area of Mexico City, my instructions for how to find where to buy a bus ticket still hold! Hi there, I will arrive to Mexico city international airport on Saturday around 9pm and then I want to take an overnight bus from Tapo to Oaxaca. Would you please kindly give me advises of the following questions. 1)Is there any bus from Mexico city international airport to Oaxaca? 2)If I have to go to Tapo to take ADO bus to Oaxaca, is there any public transportation from airport to Tapo bus termainal? If I have to take a taxi to Tapo bus termainal, how long it takes and how much is it? 3)If they open only 9-5pm, where I can buy the bus ticket? or I can buy it in the bus? There is not a bus to Oaxaca from the International Airport. There may be a Metro train to take you from the airport to TAPO but I am not positive about that. You would have to ask. I always take a secure taxi from the airport to TAPO. It takes about 30 minutes and costs about 150 pesos. You buy the bus ticket at the TAPO bus station. You cannot buy the bus ticket at the airport. You need to decide what class of ADO bus: regular ADO, ADO GL and ADO Platino and the tickets are priced accordingly, from about 400-900 pesos. You can decide once you get to the bus station. Overnight buses to Oaxaca take about 6-1/2 hours and leave from 8:30-11:30 p.m. I suggest you get to TAPO at least 2 hours before you want to leave. These directions are excellent – I would never have found this place without them. You can now buy tickets with a credit card. Craig, thanks for the feedback of appreciation. And, glad to hear one can buy tickets with a credit card. A major advancement! Hi there! Thanks for this information! I’m wondering – is the bus ride scenic? I’m trying to decide between taking the bus from Mexico City to Oaxaca City or a flight. Let me know what you think! Thanks again. Yes, the bus ride is scenic once you leave Mexico City. You have to decide about time. The ride can be 6-1/2 to 7 hours depending on traffic. If you take ADO GL there are toilets. The kiosk is really convenient and a time saver. The bus ride was comfortable and scenic, and very affordable. However, hang on to your stuff at the TAPO bus station. We left our backpacks with our 16 year old son while grabbing a coffee, and someone quickly made off with my wife’s pack. Two lessons learned! Could have happened anywhere. We should have informed our son to really keep an eye on the stuff. Instead, I think he was probably texting! Aha, I am guilty of that, too. Take good care. Kevin, thanks for added info! Wow! This is incredibly helpful if it’s up to date. We’re heading down in couple of weeks and were anticipating having to schlepp out the bus station the day before we head to Oaxaca. Instead, it looks like we can practically walk out our hotel door and take care of this. Thanks! I wonder if this is still current! If so, do you happen to remember how often the bus leaves to Oaxaca? And how long it takes to get there? I’m hoping to find a really early bus to not waste so much time on traveling. Any info is greatly appreciated! And thank you so much for posting this. Thank you so much for these directions! 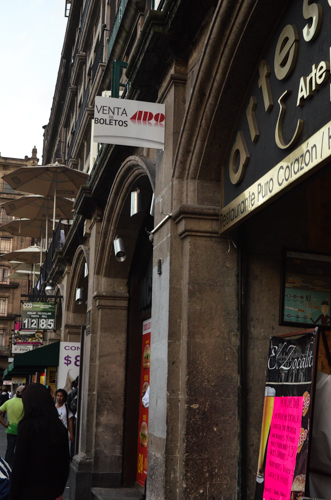 Who would’ve thought in a city as big as Mexico City there was no convenient place to buy bus tickets! The pics were very helpful too. Oaxaca here we come! April, so glad to be able to help! Enjoy Oaxaca. It’s wonderful here. Thank you thank you thank you! 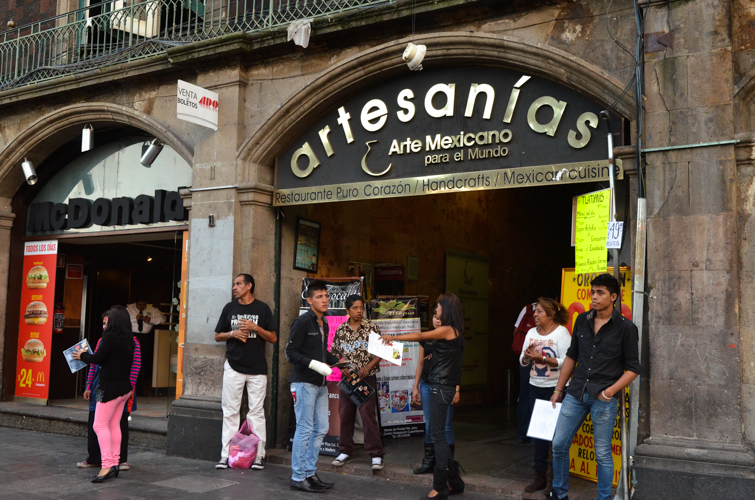 We couldn’t believe that in Mexico City it was not possible to buy a bus ticket in town. So many posts were useless and after many coffees and hours of pounding the pavements only your post was helpful and we finally found it! Thank you so much! Honestly, SO MUCH! Claire, you are very welcome. Glad to help. Thank you. Great and current information. It made my day a little easier. All the best. Thanks, Tim. Glad I could help. BTW, great projects you are working on. Looked at your website! Thank you so much for this information. After a frustrating couple of hours trying to get the ADO site to work your post saved the day. Walked to the Zocola and found the office. Unfortunately the internet connection wasn’t working so I need to return tomorrow 🙂 But at least I feel a little closer to that elusive ticket. Mucho gravitas! Julie, so glad I could help! Hope you got your ticket! THANK YOU. Very helpful post. I wondered what the ADO website never worked for me, using a U.S. credit card. Thanks much. This is ‘news I can use’ and I forwarded it to friends.